With the Chopper Charters Branson Helicopter Tours, you’ll get the chance to see the beauty of the Ozarks from the sky. This helicopter tour will allow you to see the bird’s eye view of the city, Table Rock Dam, Chateau on the Lake, and the picturesque Ozark Mountains in a breathtaking way that most people never get to enjoy. As one of the most fascinating attractions in Branson, Chopper Charters Branson Helicopter tour provides you with great maneuverability, giving you the opportunity to see spectacular views while you are hovering above the sky. 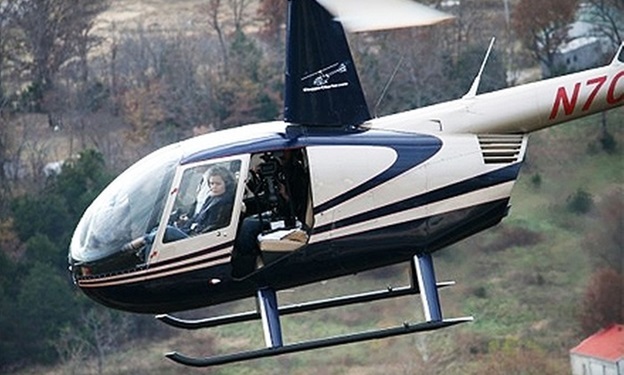 No matter what you want to view, helicopter tours in Branson will bring you there. Get to appreciate the aerial views of famous landmarks, Table Rock Lake views, Ozark mountain foliage, and even special charters. Some of the helicopter tours in Branson come with packages to surprise your date or the child who keeps asking, “Where are we going?” When you arrive on the landing pad at the headquarters, you’ll get a big wide smile which is all worth it. This helicopter ride experience is great for newlyweds, anniversaries, and one of the best engagement and wedding proposal ideas. During the peak season of tourists coming to Branson, some couples go on a romantic dinner flight to a prominent restaurant in Branson and picked up after their meal. All throughout your helicopter tour, your licensed pilot will provide you interesting facts about the panoramic views you’ll be seeing below which will make your time in the air both enjoyable and entertaining. As the helicopter takes you to the sky, you will pass over many famous city attractions in Branson as well as in surrounding locations. This helicopter tour offers five awesome tour options of 7, 12, 17, 22, or 30-minute flight around the Branson area. Each tour option brings you something exciting and more awesome than the other. The 7-minute helicopter flight will either take you to see a picturesque view of the Table Rock Dam or you can flight over Branson Landing. Either way, you will get to see spectacular views of the pristine lakes around Branson area. With the 12-minute flight, you will soar above the fascinating Inspiration Tower, giving you picturesque views of the Ozark Mountains. On this flight, you can have the bird’s eye view of almost everything in Branson – city attractions, Table Rock Dam, and the beautiful lakes. The 17-minute helicopter flight will take you to Chateau on the Lake with the chance to see Shepherd of the Hills, Silver Dollar City, and the beautiful Lake Taneycomo. If you want to see the beauty of Branson along with the natural lake waters and the expanded view of the hillsides of the Ozark Mountains, take the 22-minute flight. You can also customize your helicopter flight for anything you have in mind by choosing the 30-minute flight. So, if you want to see the many picturesque views of Branson including the spectacular Ozark Mountains, take a Chopper Charters Branson Helicopter tour.